August | 2013 | Hand Luggage. 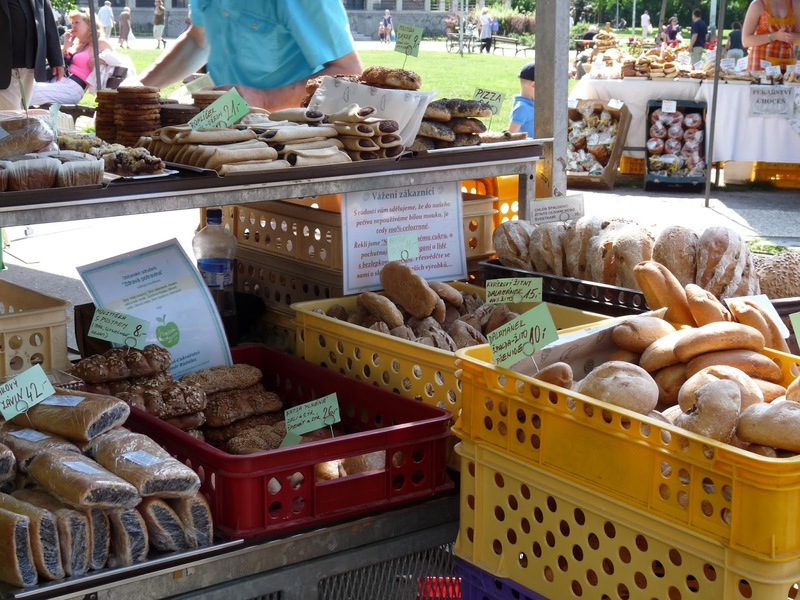 Meandering from our hotel one morning we are delighted to find a little food market has set up stalls near the metro station in the large park in Vinohrady. 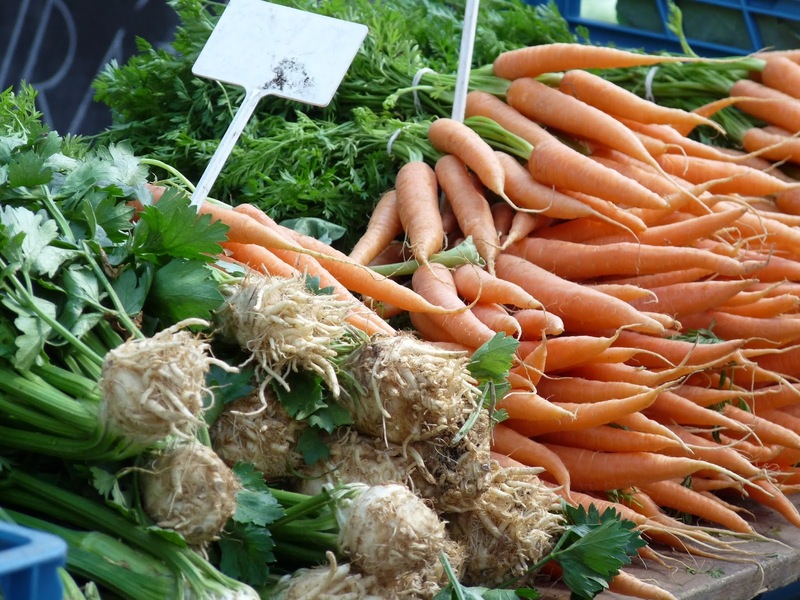 As regular readers (ha ha live in hope) are aware, I do have an overwhelming sense of joy whenever I chance upon a market. There usually follows a ridiculous amount of photo snapping. 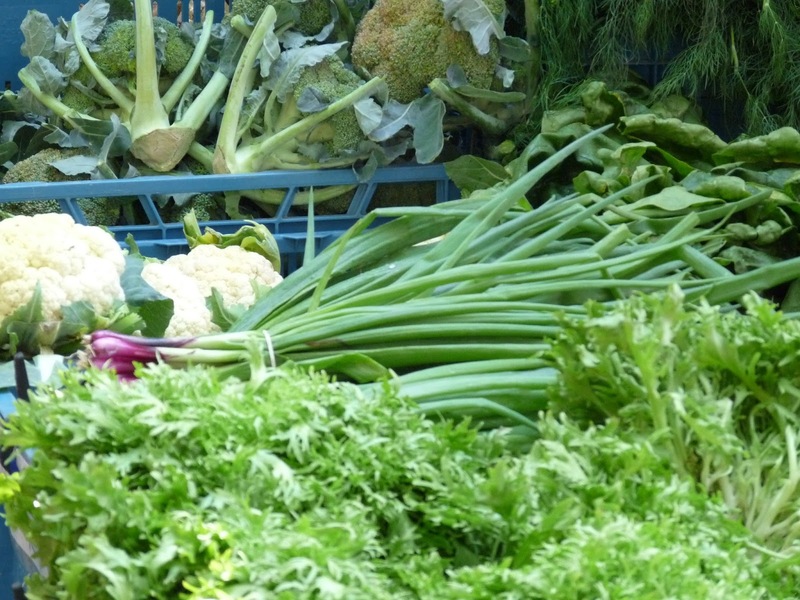 Here’s heaps of fresh produce already being snapped up by the locals. Piles of tempting baked goods threaten to derail my best dieting intentions . . . 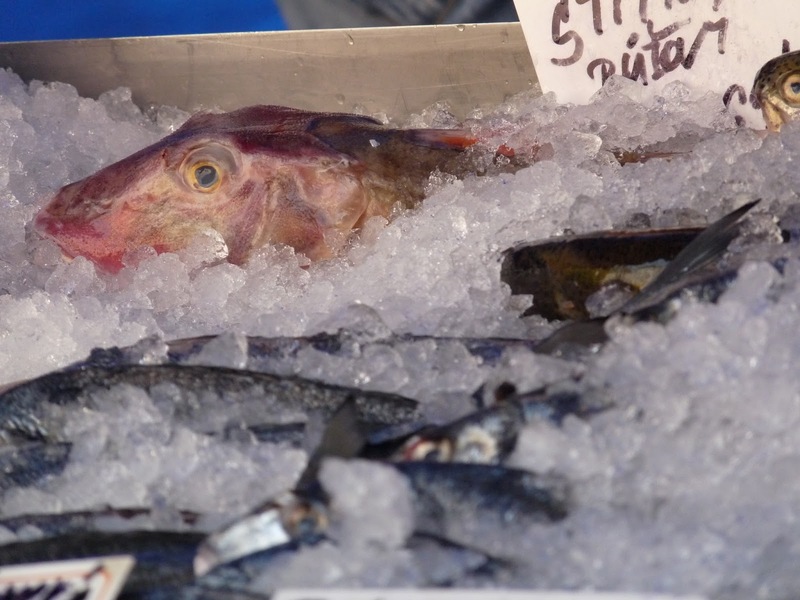 While fish stare balefully at passersby from their bed of crushed ice. 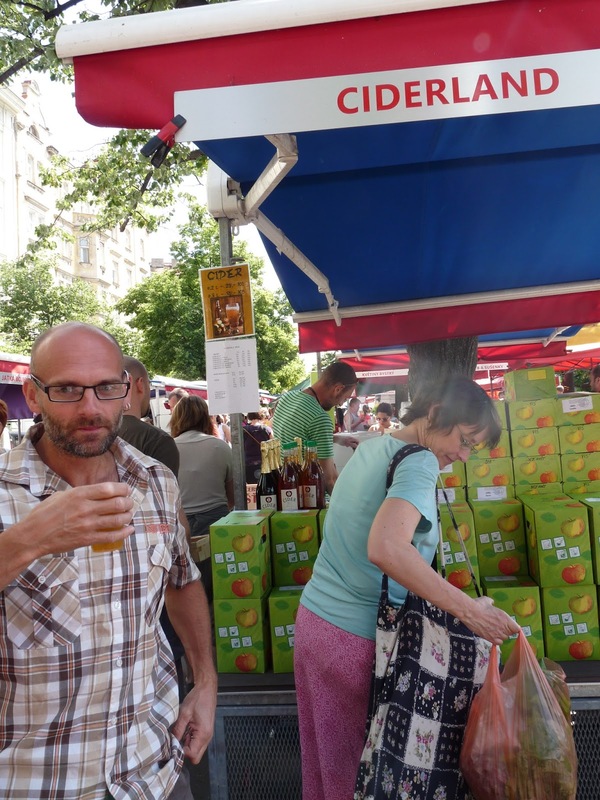 Neil is in seventh heaven with a swift half from Ciderland! 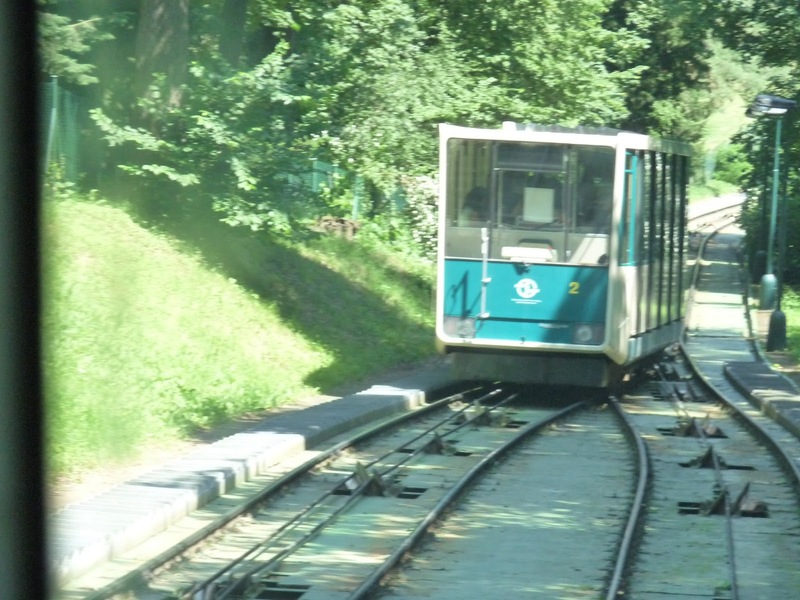 Having been up high on Petrin hill we hopped on and off the fantastic little trams that pootle all around the city. Roaming the back streets and secluded squares dotted around the city we enjoyed getting lost and stumbling across hidden gems. 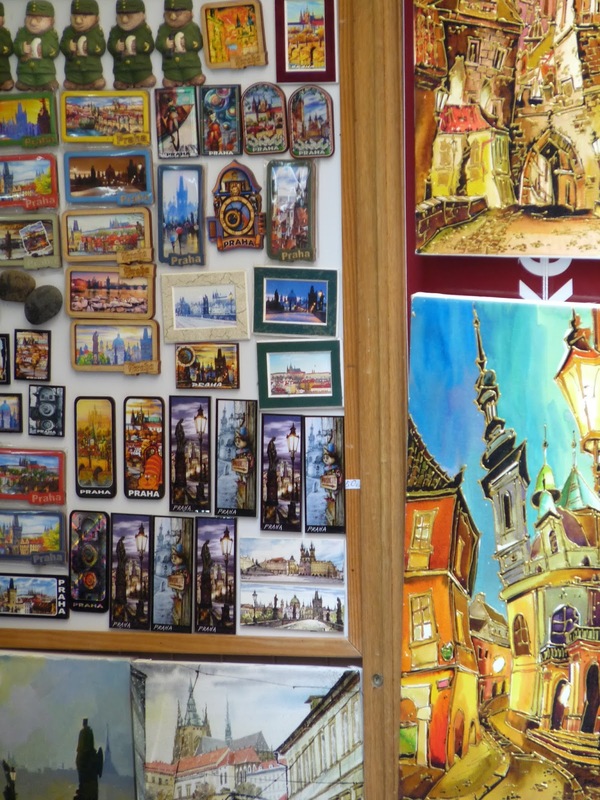 Here’s a selection of snaps of street scenes in Prague. 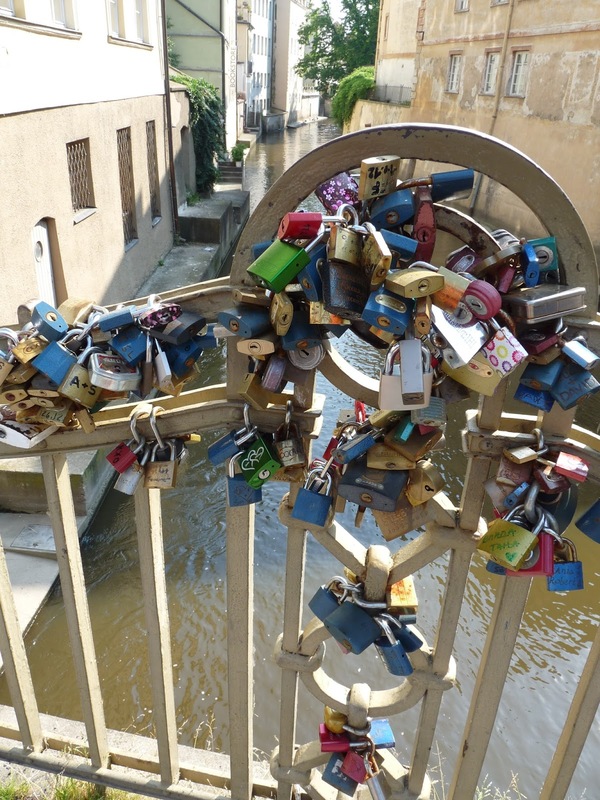 Here’s some of the lover’s padlocks on the railings overlooking Kampa Island. 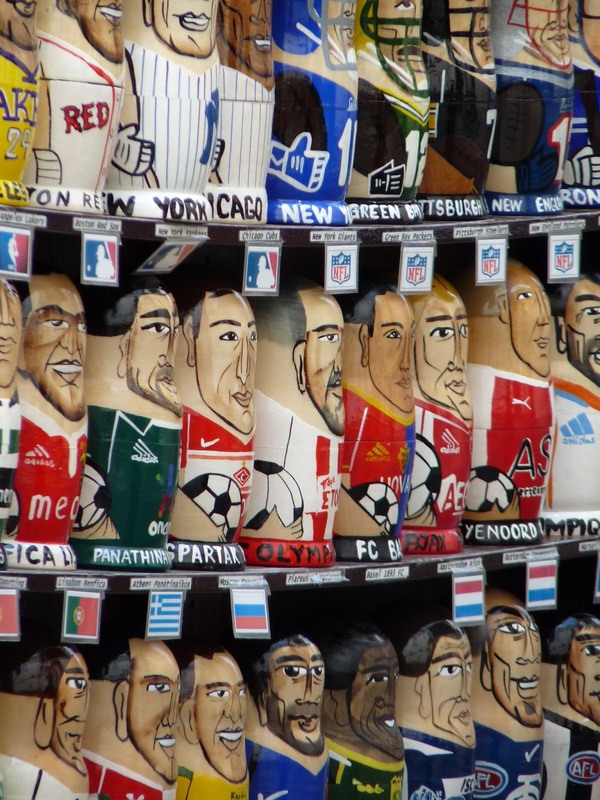 And lots and lots of stacking dolls – any footy team you fancy!!! 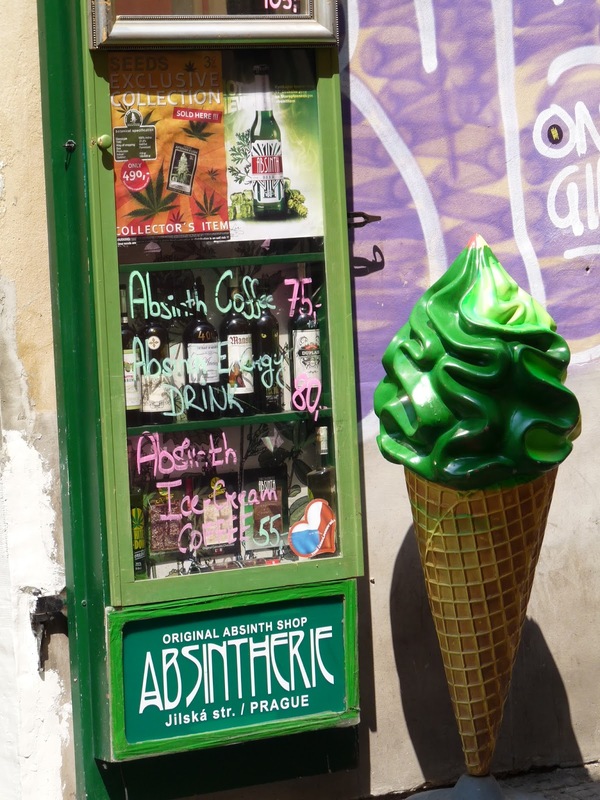 Absinth is a rather prominent feature of Prague – how do you fancy it, ice cream, slushie or beer?! 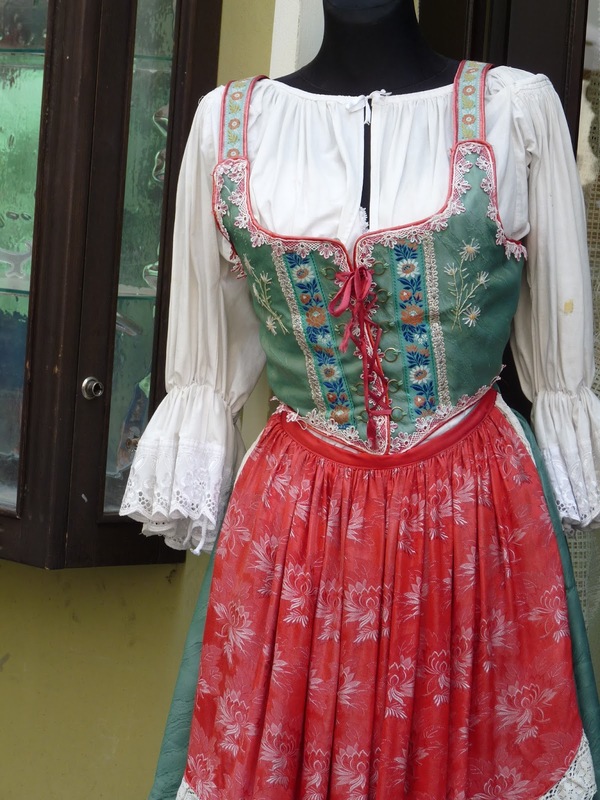 Artwork and traditional costume outside a Czech restaurant. We had an AMAZING pizza and to die for dessert at a little Italian restaurant hidden down a back street, took a brief gander at the tourist stag mecca that is Wenceslas Square and also stumbled across the Czech Symphony Orchestra giving a concert to thousands! There’s something happening around every street corner from the mundane to the comic to the soul stirringly beautiful. All in all, a phenomenal city to visit that ranks highly in my most see list. 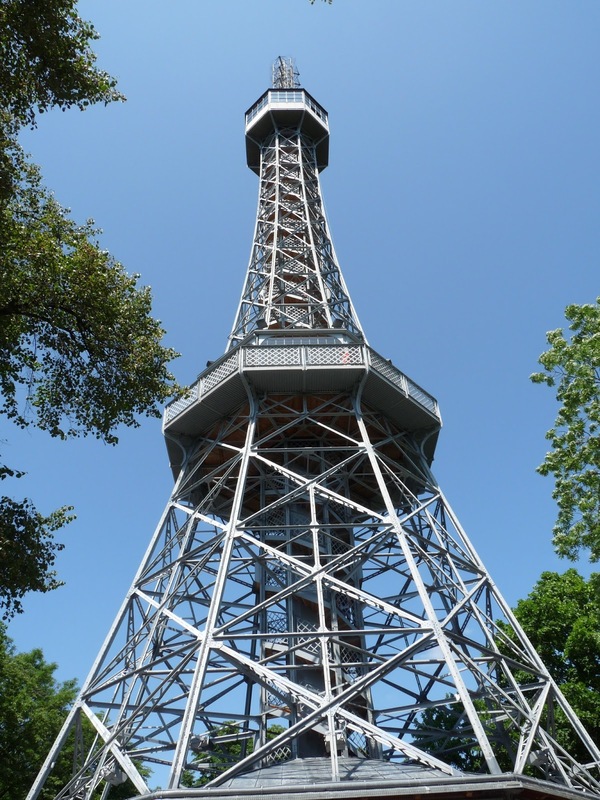 Built as a mini version of the Eiffel Tower, the Petrin Observation tower was built in 1891 for the Jubilee Exhibition. 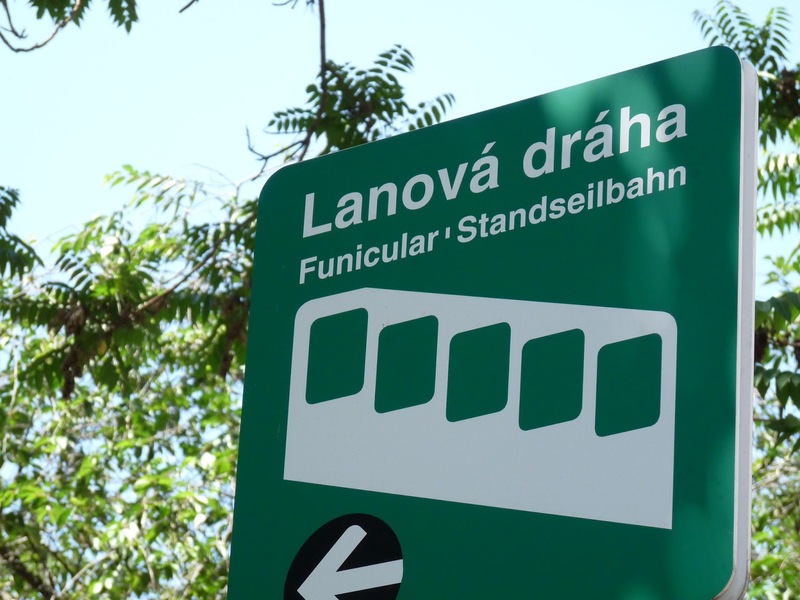 Even better, the funicular forms part of the Prague public transport network, so a single ticket for travel on trams, buses and the metro is also valid on the funicular. 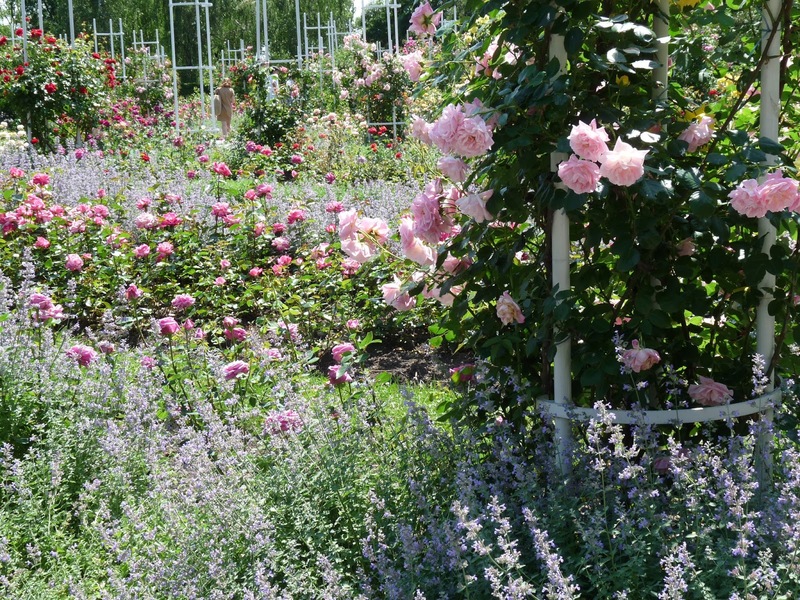 On arrival at the top of Petrin hill you can take in some gorgeous rose gardens and sniff yourself giddy on the sumptuous rambling old roses. 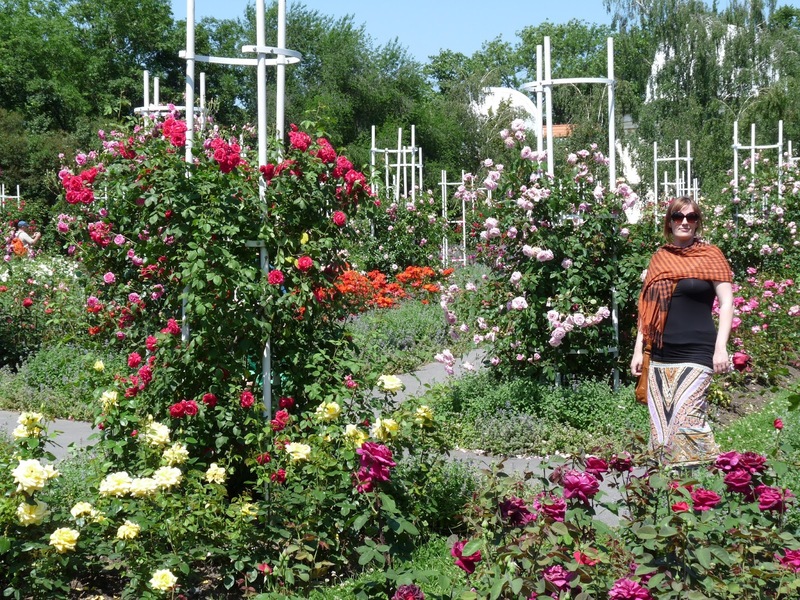 Me, posing, amongst the multitude of roses. 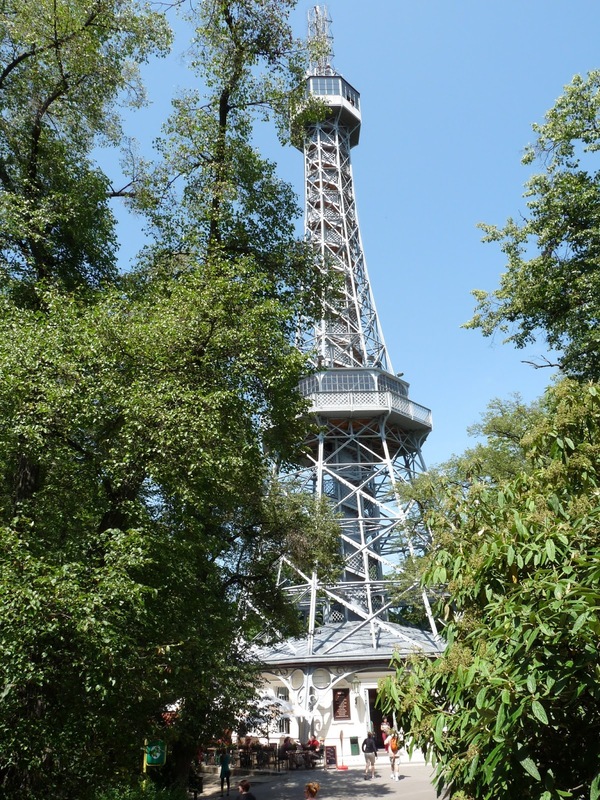 Then you can head to the mini homage to the Parisian masterpiece – The Petrin Tower! 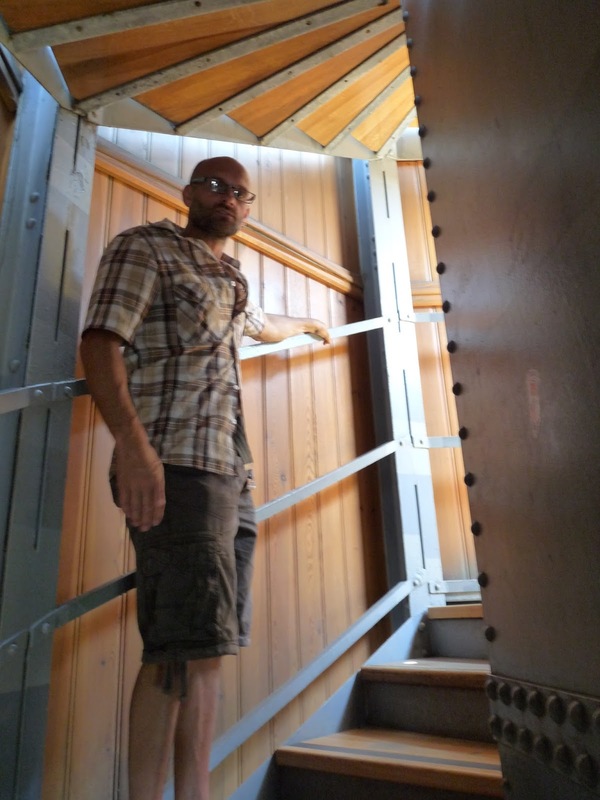 There’s 299 steps to the top – and the lift was out of order . .
View on the way up . . . 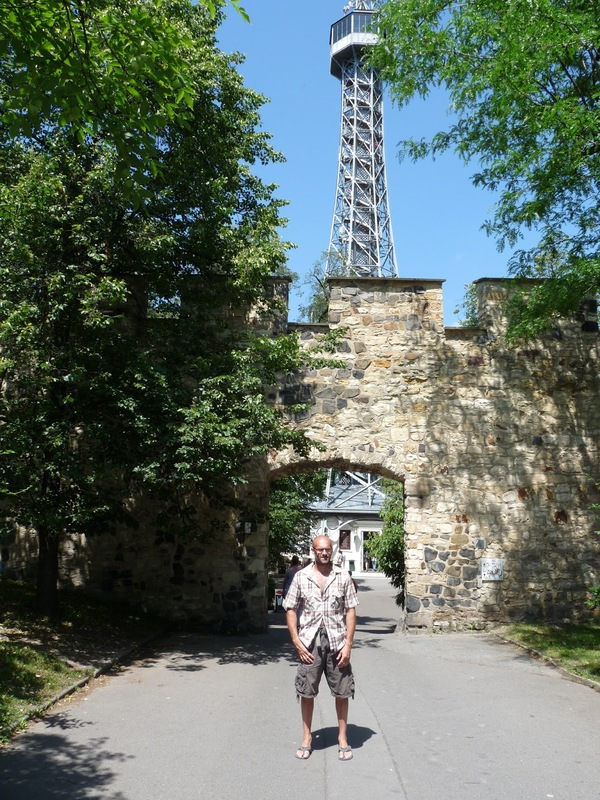 But the pay off for all the huffing and puffing up the steps (wondering why no one is coming down) is the best view of Prague anywhere. 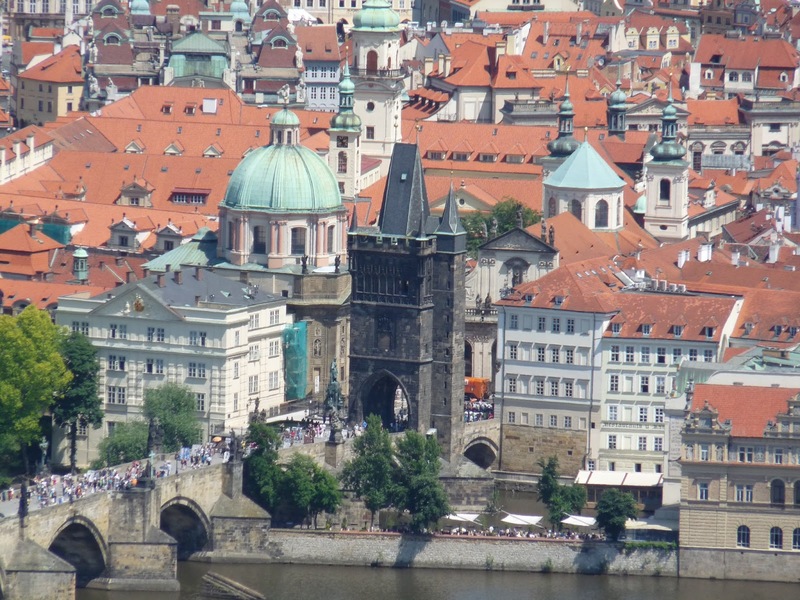 Tiny tower on Charles Bridge. 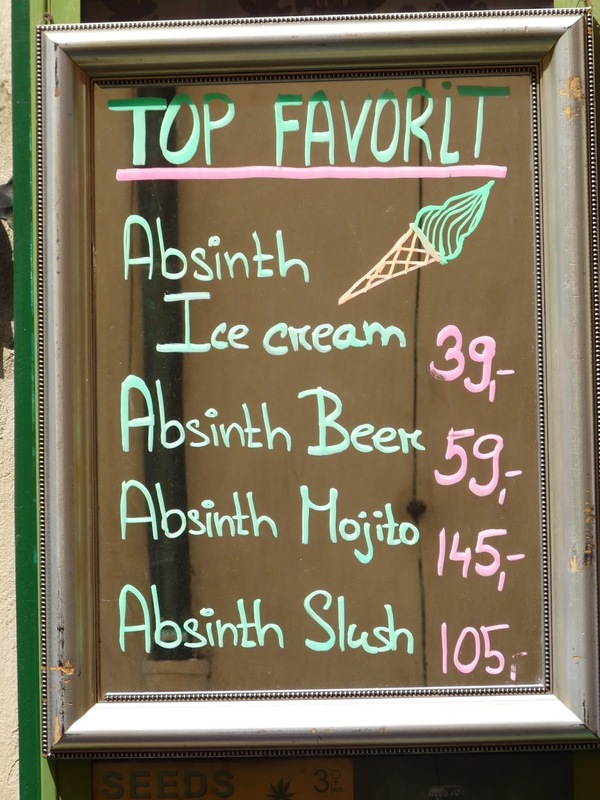 (Was a trifle concerned they had all passed out at the top!!!). 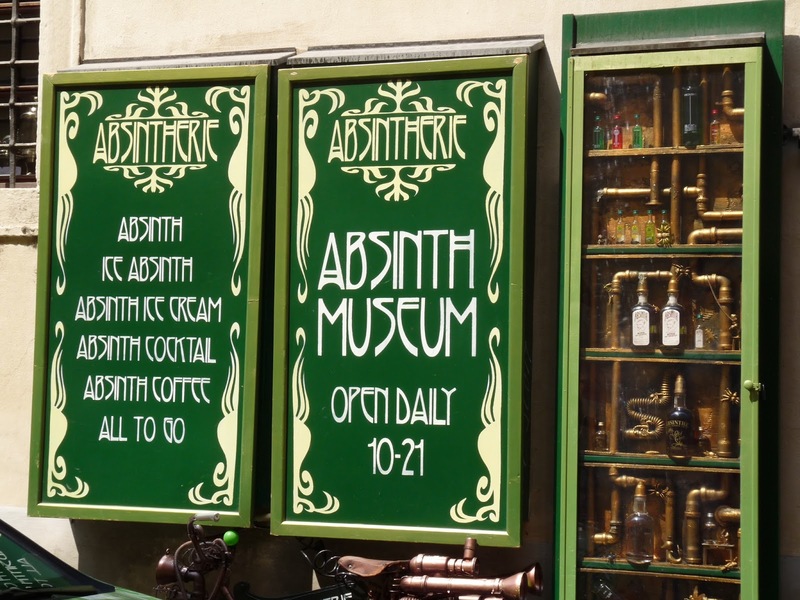 Men dressed as giant condoms and the gaggles of hen parties aside, Prague has some truly amazing sights to see. 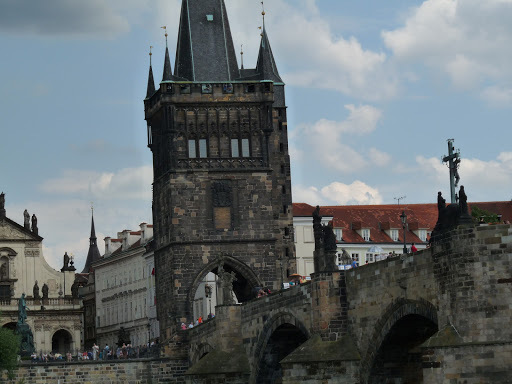 One of the most iconic sights is the Charles Bridge. 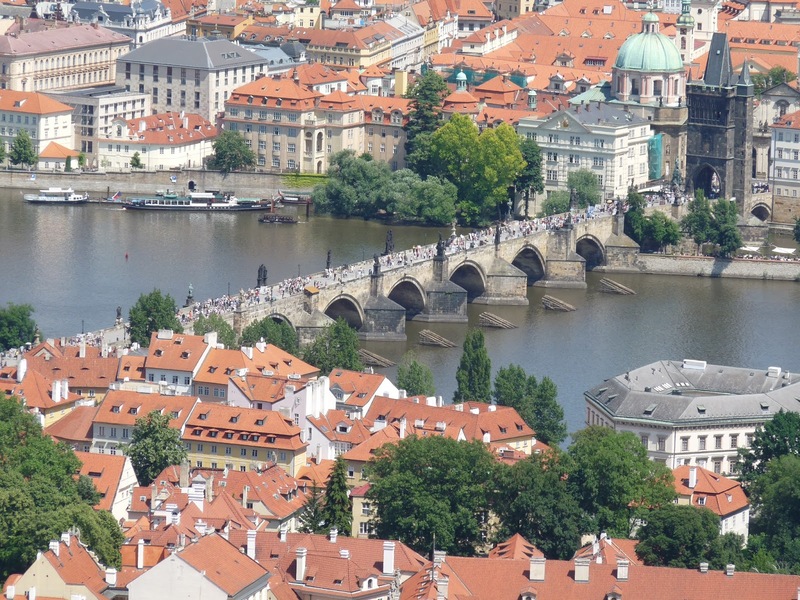 The impressive bridge spans 621 metres across the Vltava river. It is almost 10 metres wide while 30 statues, 16 arches and three bridge towers add to the impact of this formidable piece of history. Artists, craftspeople and caricaturists set up shop along its length during the day. 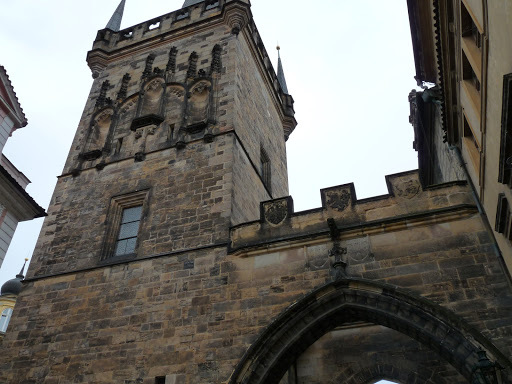 Construction started in 1357 and finished in the beginning of the 15th century. 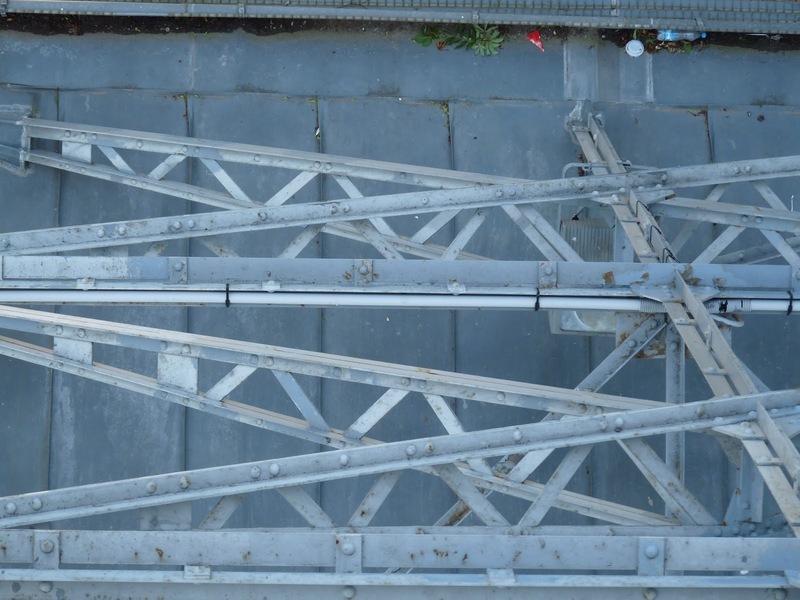 Designed by Peter Parler the bridge replaced the former Judith Bridge that had been badly damaged by a flood. Half way across the bridge a flight of steps leads down to give you access to Kampa Island. 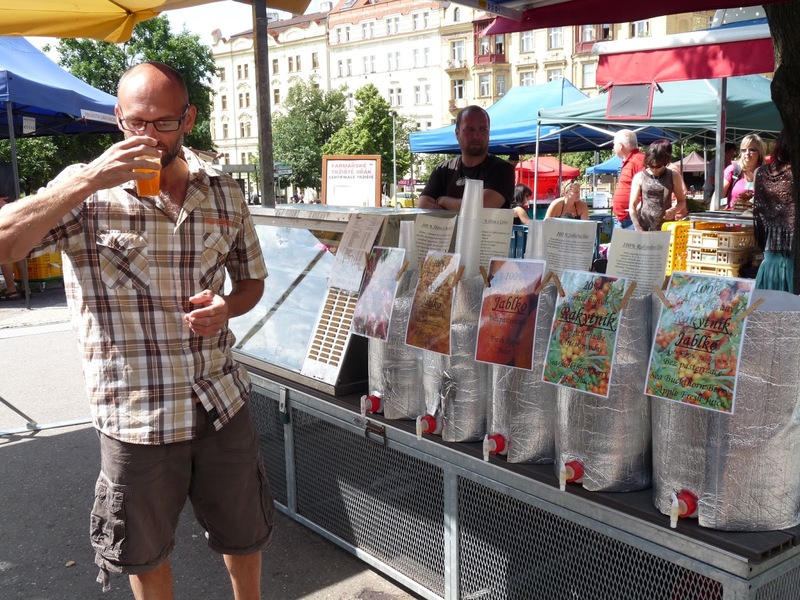 When we were there stalls, music and roasting meat gave it a Bavarian air. 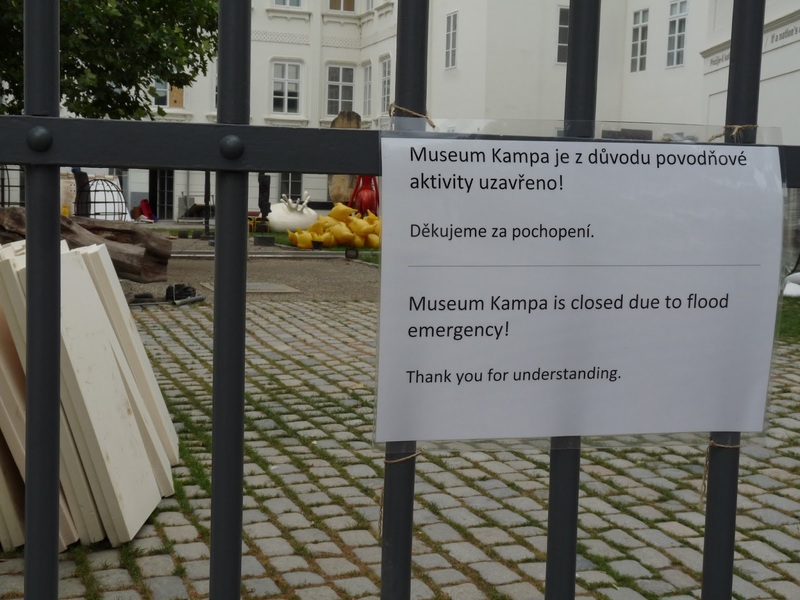 There is a modern art museum situated on the island, but sadly, due to the recent flooding, it was closed for refurbishment. Peering into the courtyard we could see the brightly coloured exhibits strewn across the floor and jumbled together, a testament to the power of the water. 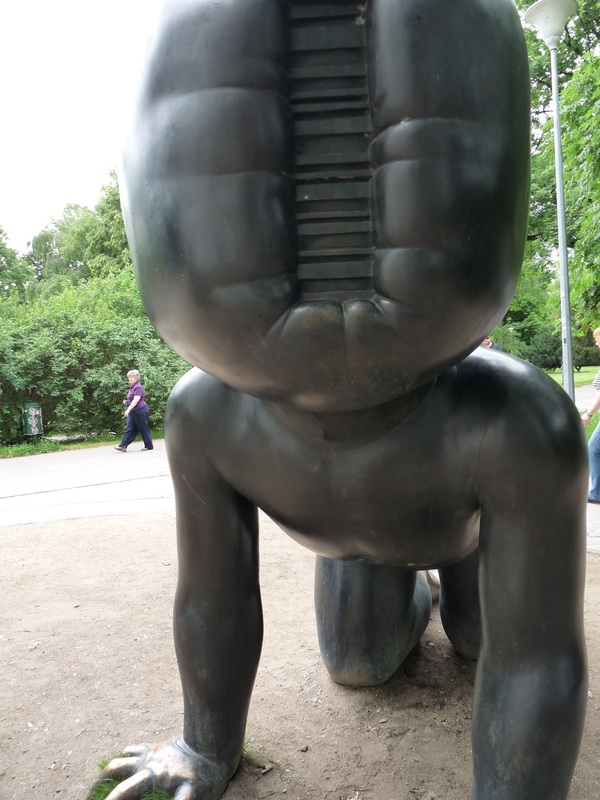 The disturbing giant babies by David Cerny at Kampa Modern art museum. One of the bridges most often photographed attractions are the 30 statues ranged along its length. 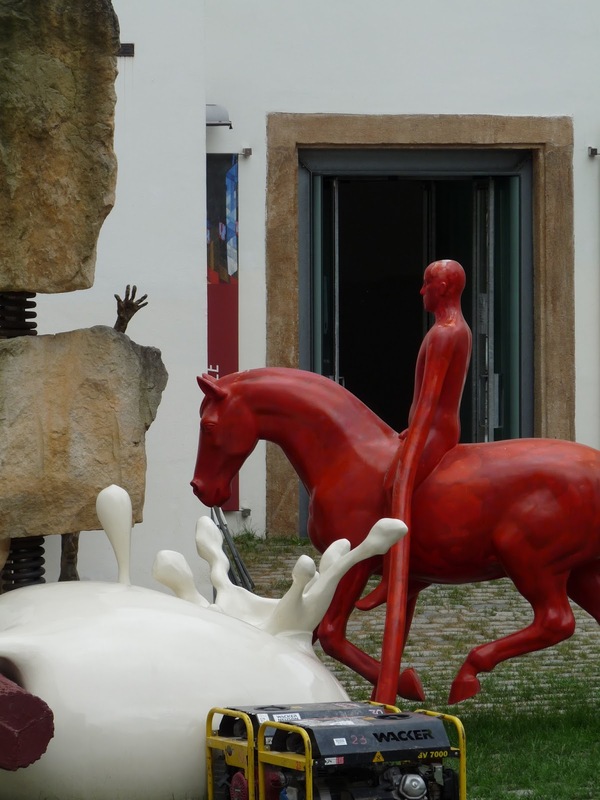 Most sculptures were erected between 1683 and 1714. 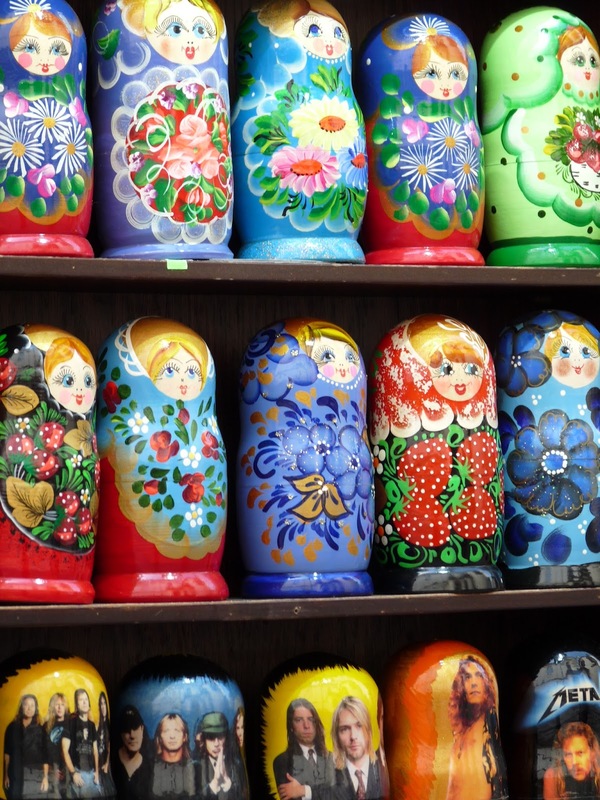 They depict various saints venerated at the time. Here’s photographs of just a few of them. 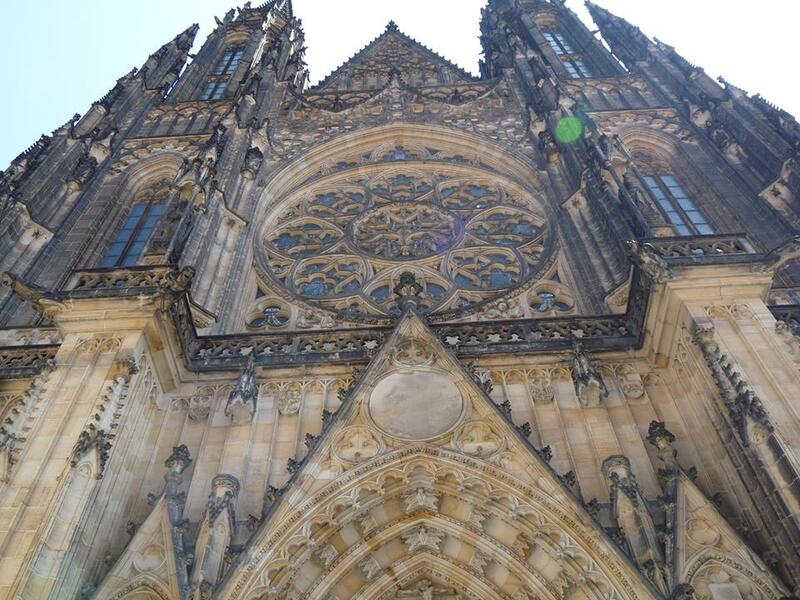 One of the main sights is the impressive Prague castle that dominates everything from its commanding position above the city. 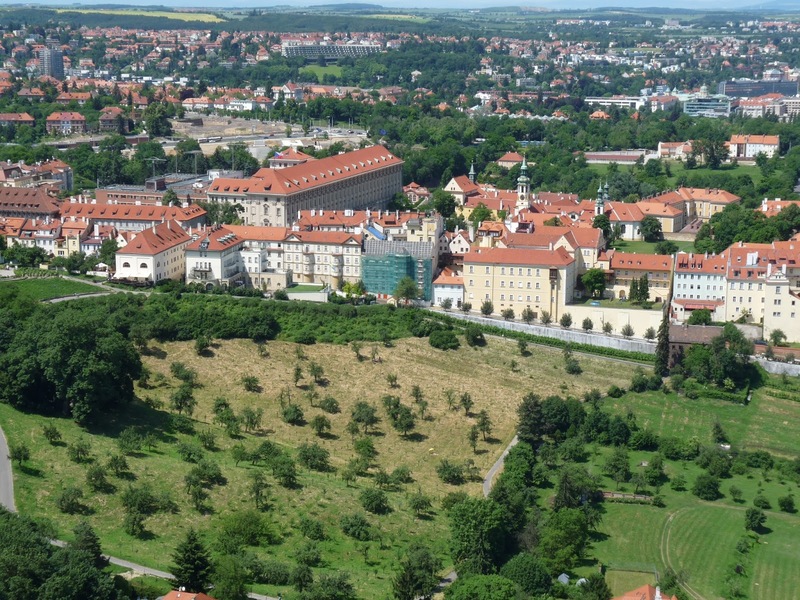 According to the Guinness Book of World Records, Prague Castle is the largest coherent castle complex in the world, with an area of almost 70,000 square metres. 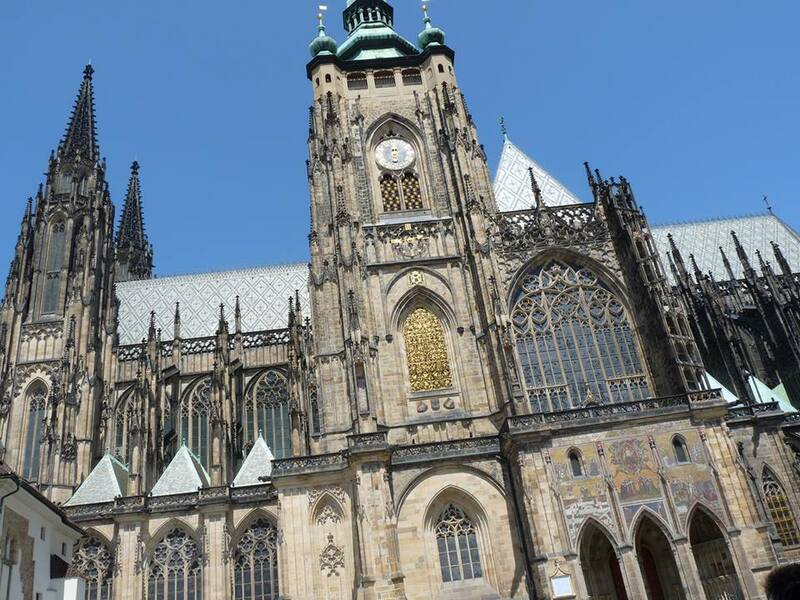 It’s also a UNESCO World Heritage site and is crammed full of awe inspiring architecture such as the Gothic St.Vitus’s Cathedral pictured below. 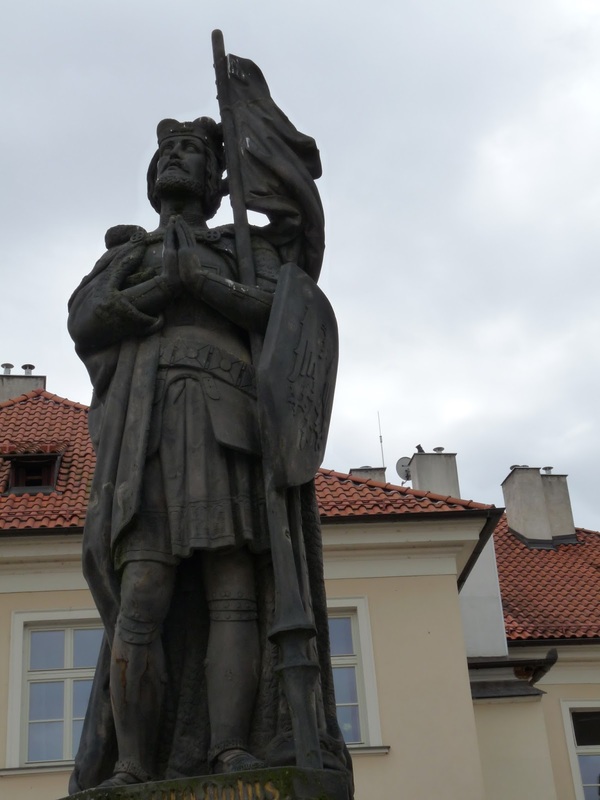 St.Wenceslas, the main Czech patron saint, is buried in the Cathedral that towers up from the courtyard. There’s so much to marvel at including the huge ornate rose window with its jewel bright stained glass. 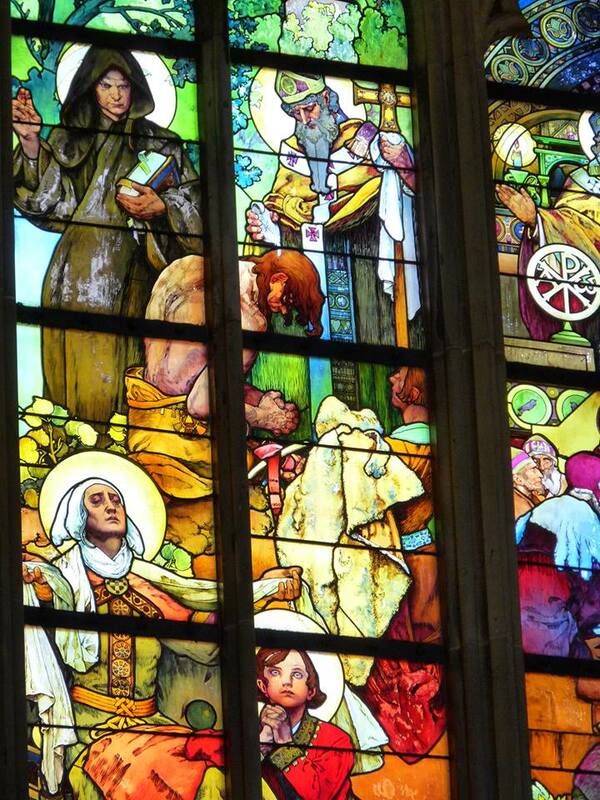 Here’s part of the stunning stained glass window by Alphonse Mucha that was installed in the north nave in 1931. The window shows St. Wenceslas as a boy with his grandmother St. Ludmila in the centre, it’s surrounded by scenes from the lives of Saints Cyril and Methodius who spread Christianity among the Slavs. The Golden Gate marks the southern entrance to the cathedral. 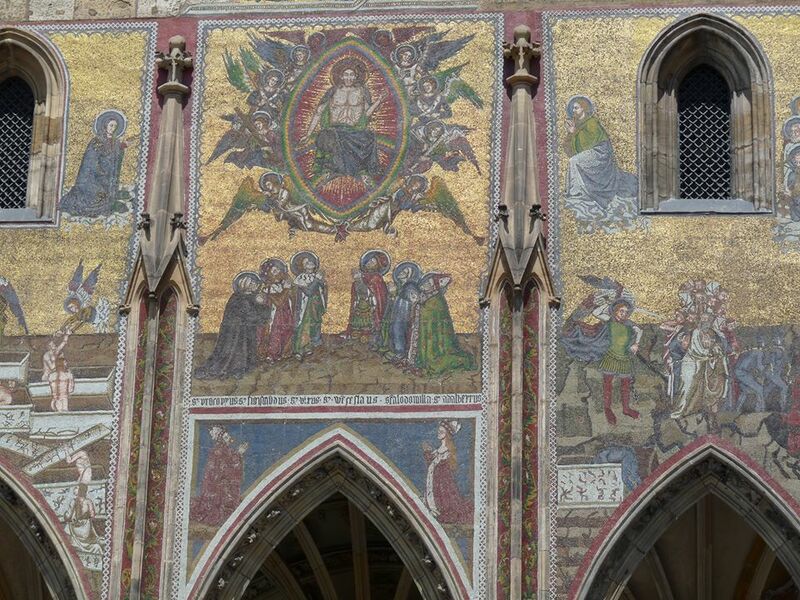 It’s decorated with a beautiful gilded mosaic of the Last Judgement and dates from the 14th century. 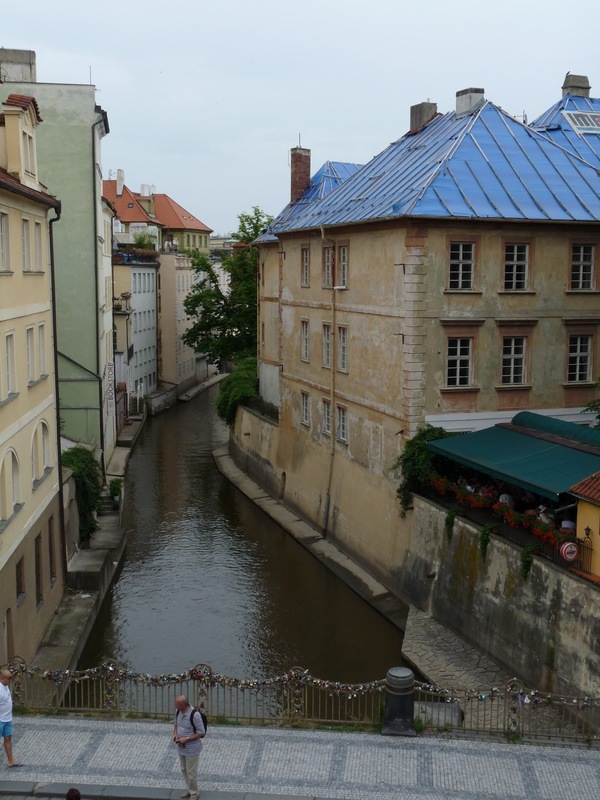 Other sights in the complex include Golden Lane that dates from the 15th Century and has eleven historic houses where period scenes have been recreated to show the life of the artisans who once worked, ate, drank and slept in them. 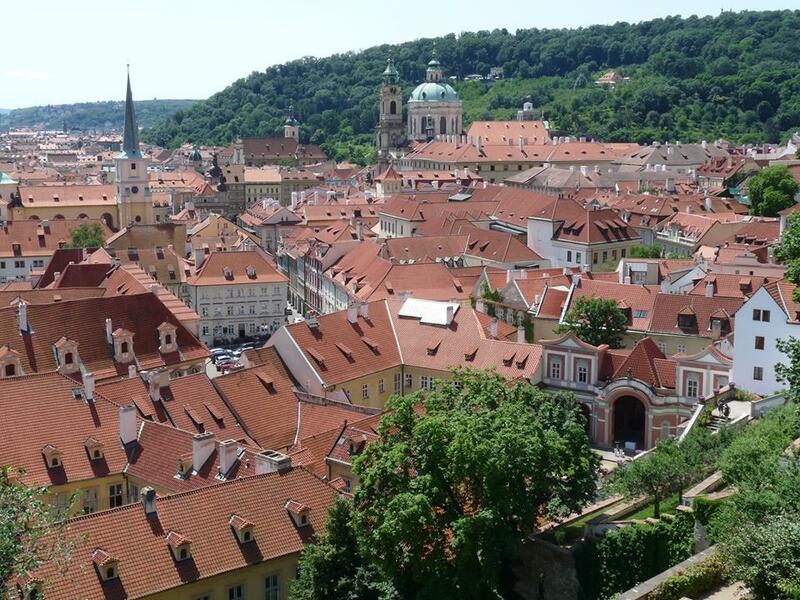 From the castle walls you have a stunning view of the terracotta roofs of the city stretching into the distance. Meander your way back down to the city through the castle gardens, slopes covered in green vineyards, rambling roses and the buzzing of hundreds of industrious bees. 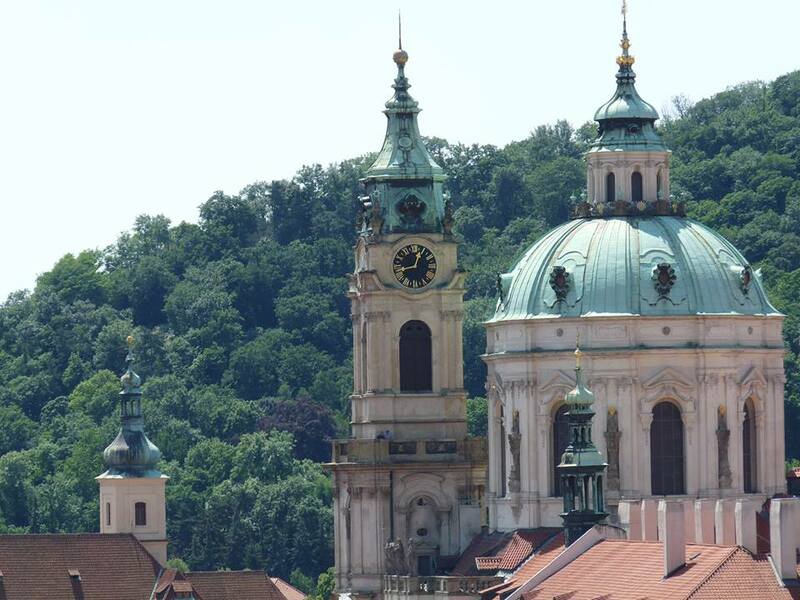 We staggered off the night train, blinking and yawning into the glaring heat of the Prague morning. Half seven and already 27 degrees. Not a good start for a vampire shade seeker like me. First stop, we needed to ditch the bags so head straight to our hotel. 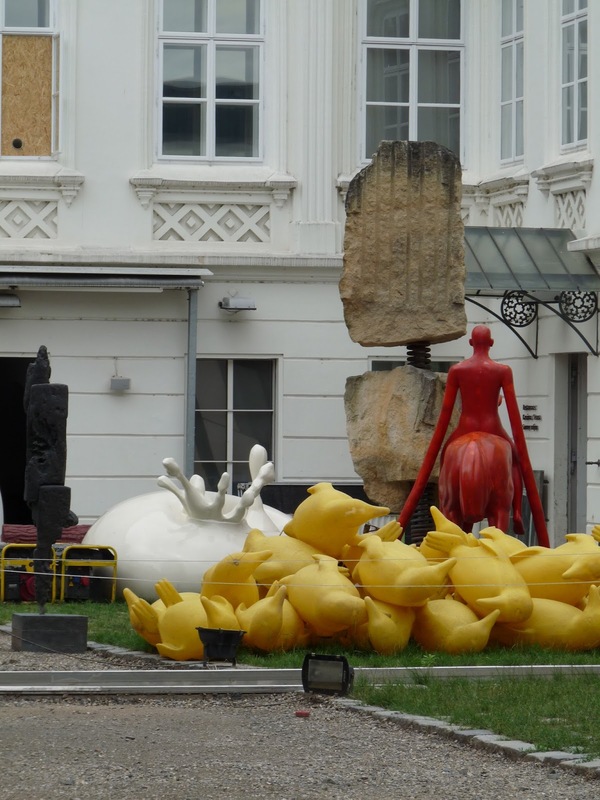 The marvellous Louren Hotel, situated in Vinohrady which is in neighbourhood 2. 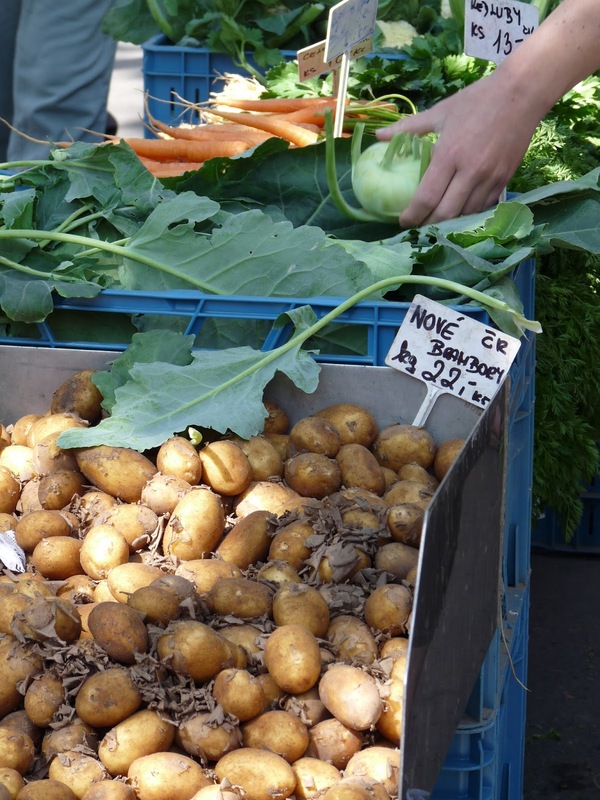 It’s not in the old town centre but a super simple ten minute journey from the centre on the green metro line. Just hop off at the Jiriho z Podebrad stop. You can find out more about Louren hotel on their website. 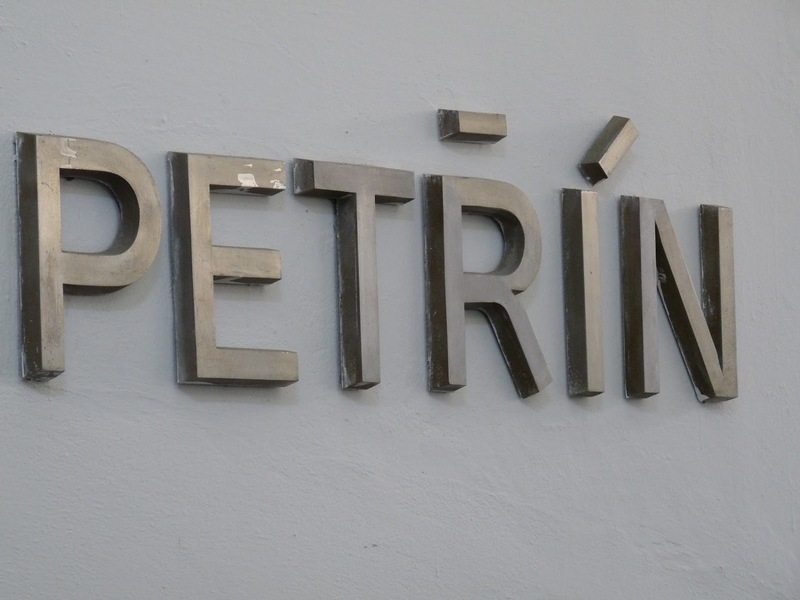 I can heartily recommend it, marvellous service, lovely rooms and a great place to stay if you do not want to be right in the hectic centre of Prague. 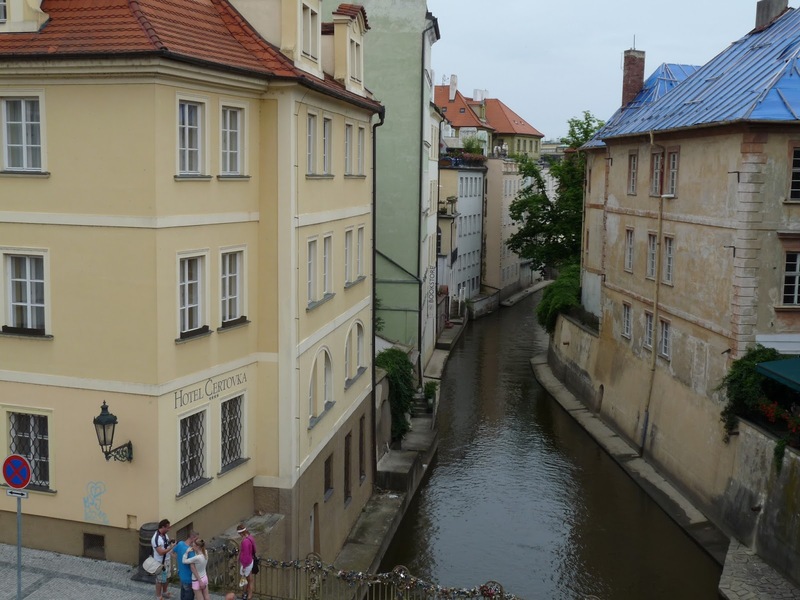 Once unburdened we headed back into the old town centre to check out some of the awe inspiring architecture of Prague. 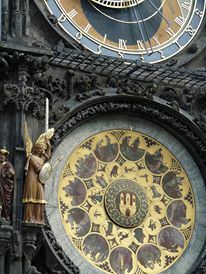 Arriving just before the hour in the old town square – Staroměstské náměstí – we were perfectly placed to see one of the main tourist sights, the Astronomical Clock striking the hour. 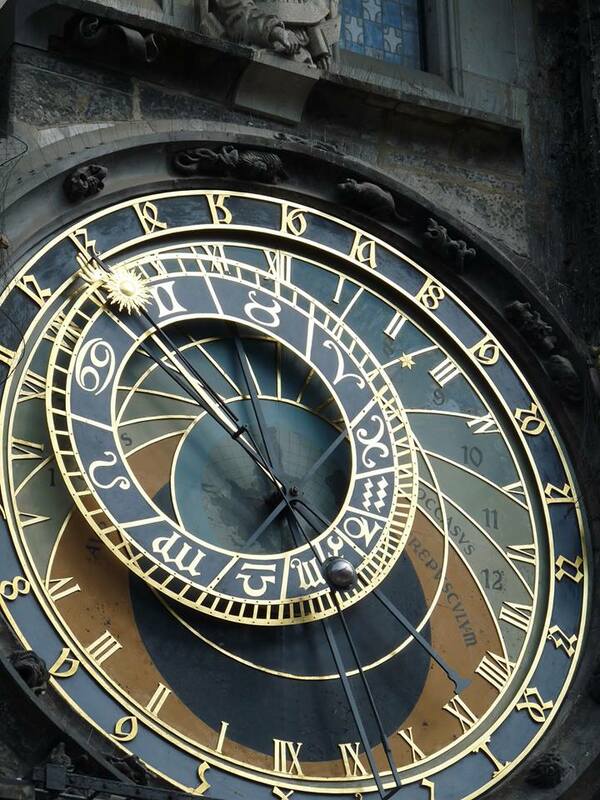 This beautiful piece of time keeping art dates from the 15th century. The clock is intricately constructed, and each hour crowds of people gather to watch the procession of the Twelve Apostles. Every hour, a small trap door opens and Christ marches out ahead of his disciples, while the skeleton of death tolls the bell in a grim nod to the passage of time. 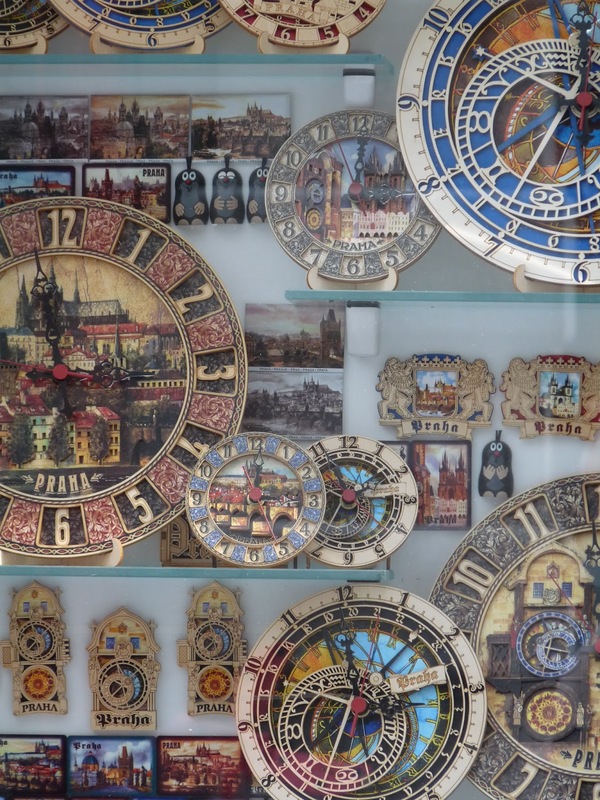 Four figures flank the clock and these represent things that were despised at the time of the clock’s making. From left to right the first is vanity, represented by a figure admiring himself in a mirror. Next, the miser holding a bag of gold represents greed. Across the clock stands Death, a skeleton that strikes the time upon the hour. Finally, the Turk represents pleasure and entertainment. 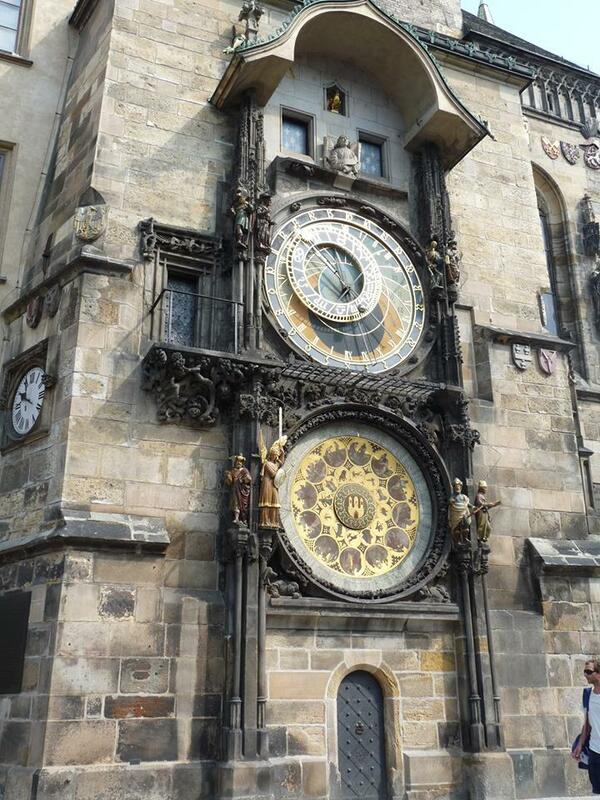 Below the Astronomical Clock are 12 medallions with the signs of the zodiac, added by Josef Manes in 1865. 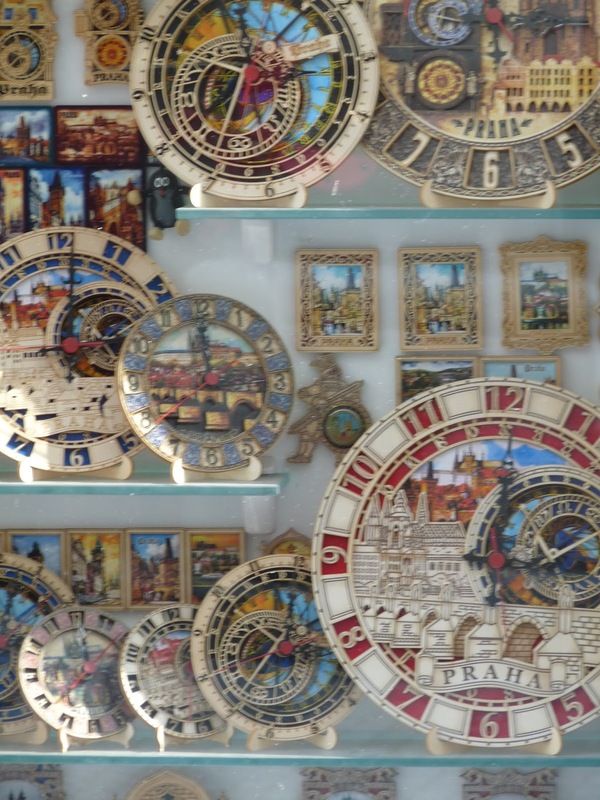 Apparently the clock maker was blinded on the orders of the Prague council to make sure he could never make something so beautiful again. Nice. All aboard the night train . . .
No apologies for using the title of one of my all time favourite cheesy mid 90s dance tunes in the name of this post! Waving goodbye to Poland we got set to board the night train to Prague. Leaving Krakow at 10.01pm it rolls into the Czech Republic at 7.30am. 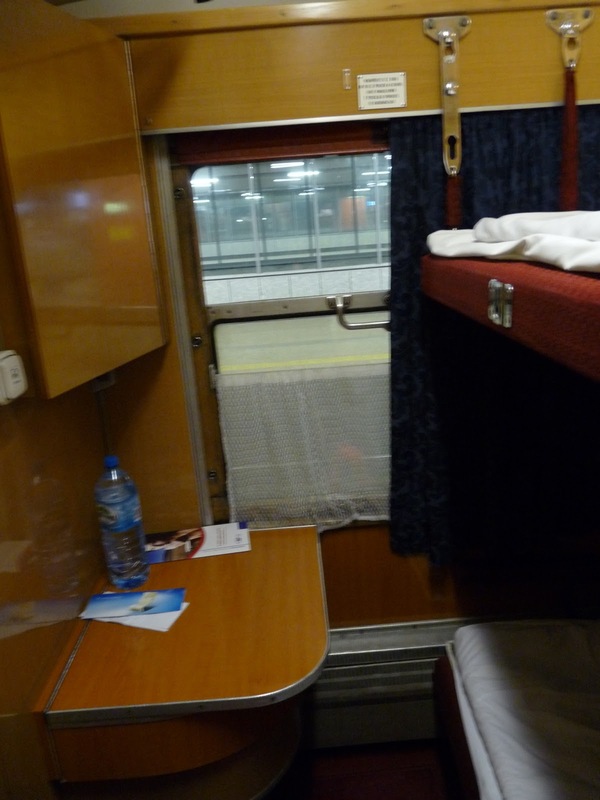 For some reason you can’t easily book Polish rail tickets online without using a third party so we opted for the services of Polrail to buy the tickets on our behalf. We got them to post the tickets to us at home before we arrived in Poland. Slightly apprehensive at first about doing it this way but they provided a quality service and the tickets were dispatched in good time. 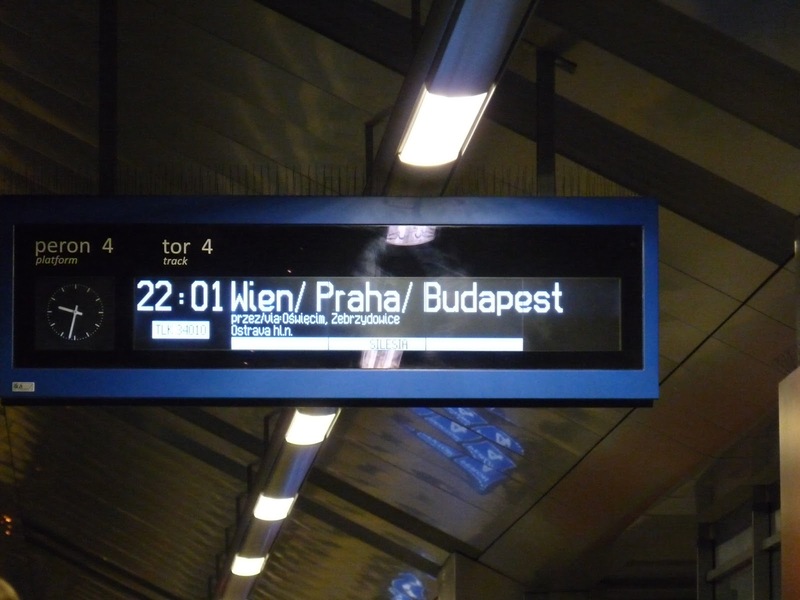 We scoped out the train station the night before just to make sure we knew which platform the train left from as the train timetables are rather large, unwieldy and not conducive to a quick scan in a hurry! 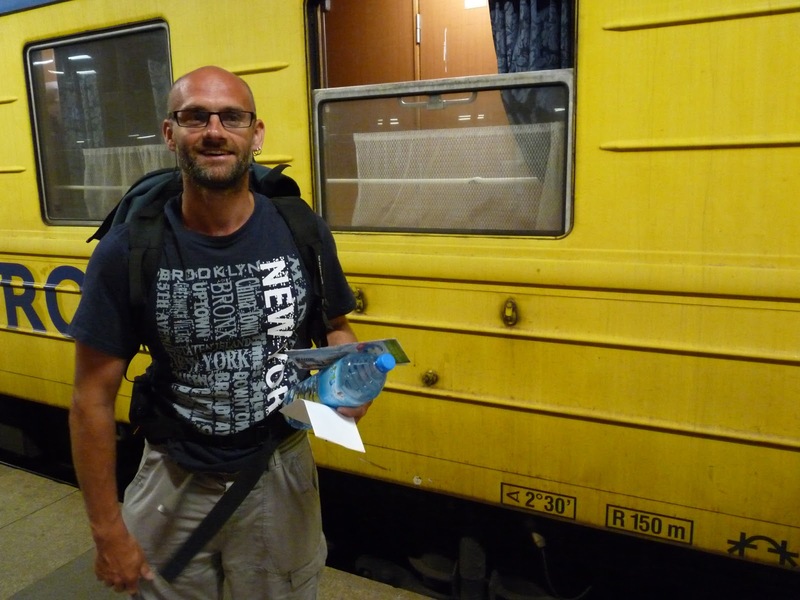 Here’s Neil about to board the night train. Check you’re in the right compartment as the train splits at some point in the night, some carriages go to Prague, others head off to Budapest!! 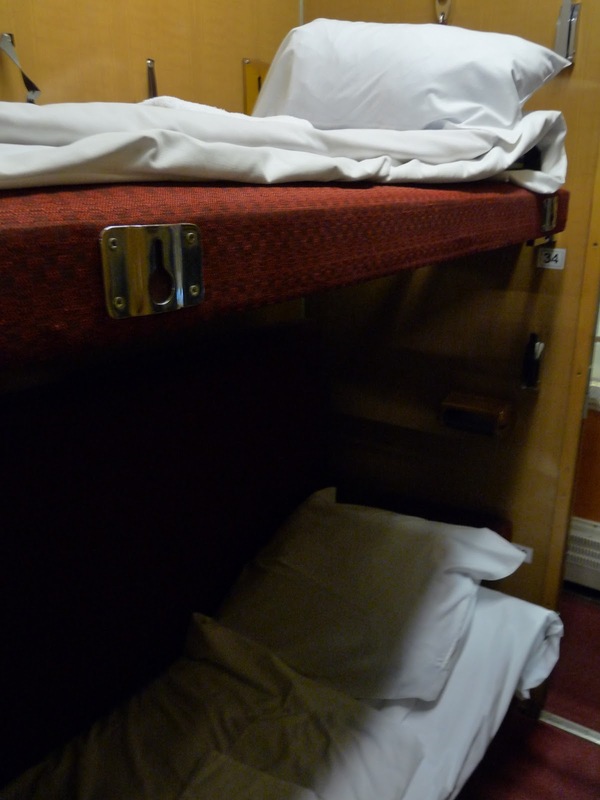 Here’s the interior of our cosy home for the night, a two berth couchette. 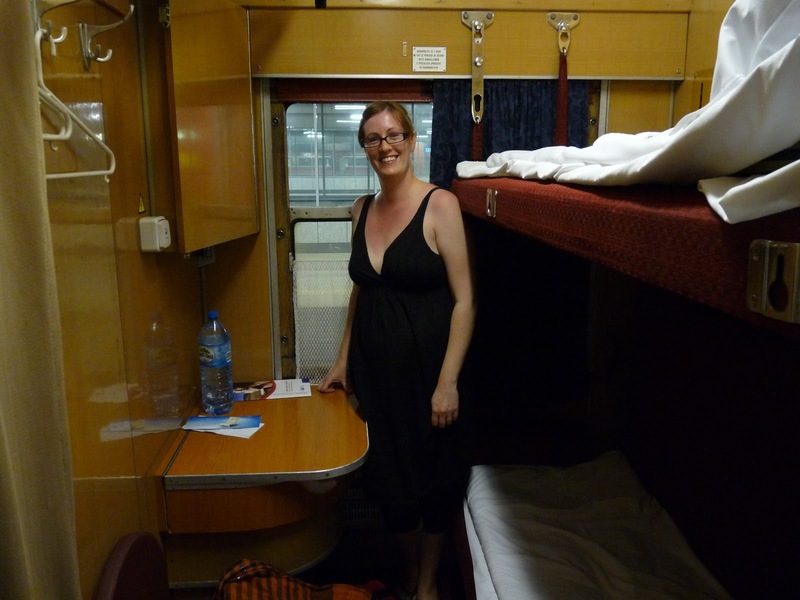 Complete with hidden sink (demonstrated below) two bunk beds and very warm bottled water! The room was SUPER hot as it was a roasting day. 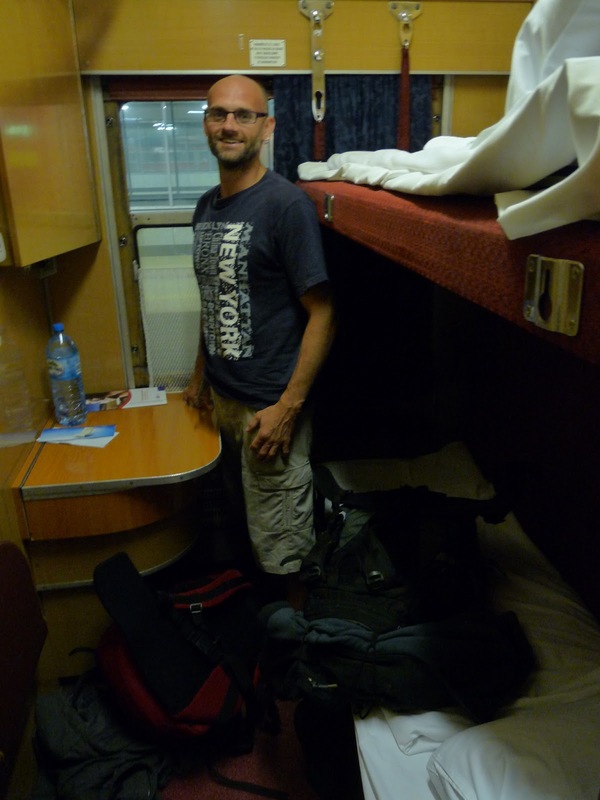 After enjoying the novelty of sitting at the window watching the night time scenery fly past for a few hours Neil slept like a baby. I lay awake all night . 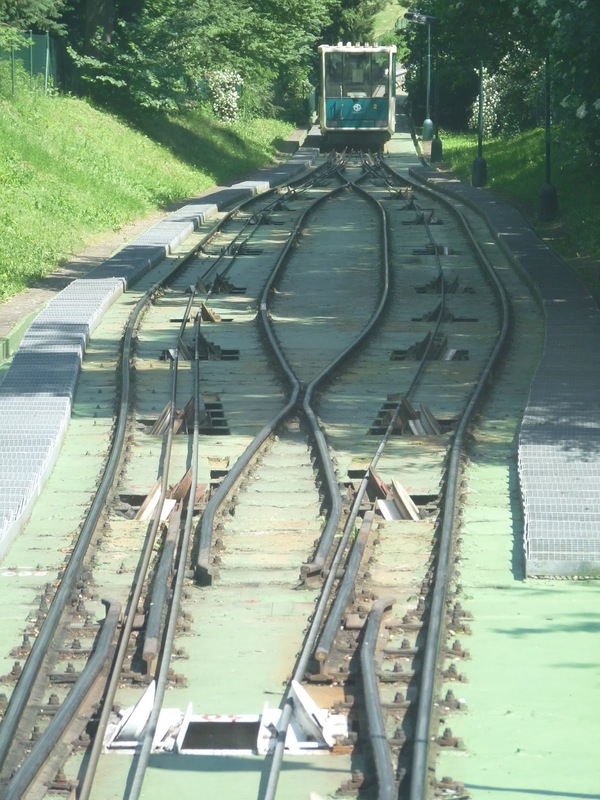 . . it was not the quietest of nights due to the shunting and bumping as the train decoupled carriages and adds others, not to mention the station announcements throughout the night. Arriving at Prague it was already 27 degrees at half seven in the morning . .. no signs of the previous flooding. It was going to be a scorcher!!! Blow to the ego but digital learning! 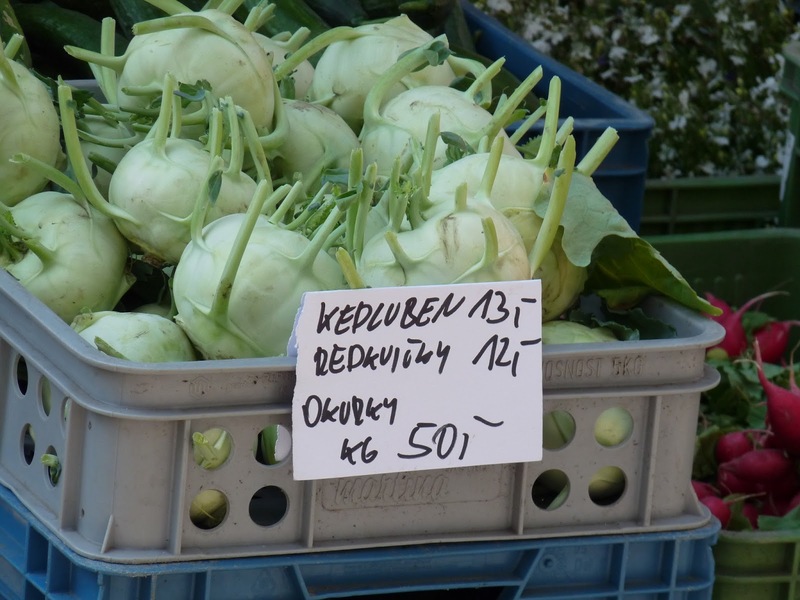 Mixing up the posts a little now, a bit of travel, a bit of digital learning through trial and error! Today’s lesson – viewers, audience and discrepancies between the figures on Blogger’s stats and Google analytics. For a while I was content to skip along in blissful ignorance and go by the far better Blogger stats, but, in the spirit of trying to get to grips with this here internet, digital malarkey, I thought I better check out why there is such a discrepancy. Turns out that GA is by far the most accurate and reliable source of visits (but also the most soul destroyingly honest) where as Blogger, like a kind relative that assures you that “yes dear you have talent” records every little cough, spit and interaction that the world wide web makes with your site. 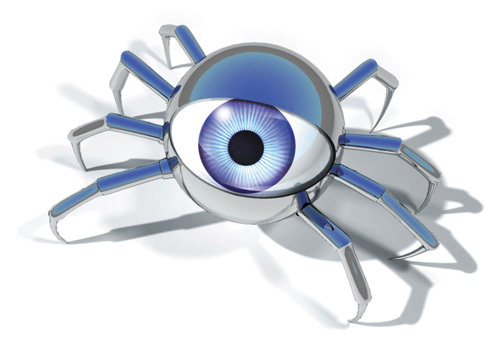 This means including the creepy spiderbots that “crawl” the internet and your pages for content to index. So most of my visitors, that I had hoped were of the fleshy human variety, are actually virtual crawlers, swarming my site on a daily basis and inflating my score (and ego) artificially!! BOOOO and a little bit flesh crawly . . . .
Oh well, you live and learn . . .